Traffic on I-5 heading to NBA or NHL games at KeyArena will be slow, but it'll be much worse for eastbound traffic trying to get onto the highway at rush hour. 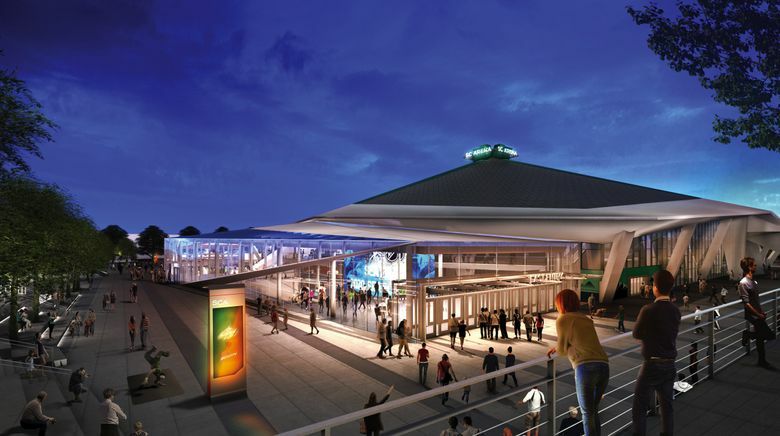 A draft environmental impact statement (EIS) on the proposed KeyArena renovation project concludes that vehicle traffic heading from Interstate 5 toward NHL or NBA games at the venue would experience some slowdowns but likely would avoid major snarls. The 627-page study by the Seattle-based Environmental Science Associates firm examined traffic flows along the Mercer Street corridor and Denny Way and used projection models to anticipate the impact of fans heading to the renovated facility weekdays the hour before a game. It concluded the bigger problems on both major transportation routes in the pregame hour of 5:30-6:30 p.m. would be for eastbound vehicles heading away from KeyArena because of rush-hour bottlenecks at on-ramps to access a congested I-5. “Given the highly directional nature of athletic and other special events, directional travel time is important to consider,” states the study, prepared for and released Monday by the City of Seattle’s department of construction and inspections. That doesn’t rule out slowdowns: The draft EIS estimates that on “above average” attendance days for all events at Seattle Center, traffic heading westbound on Denny toward the venue pregame would slow to about 50 percent of a “free-flowing” 10-mph speed, and on Mercer it would drop to 45 percent. It would take 9 minutes to get from I-5 to KeyArena on Mercer and 10 minutes on Denny at such speeds. That’s still better than eastbound traffic heading away from the arena toward I-5, which would slow to 20 percent of free-flowing levels on both Mercer and Denny. That trip would take 27 minutes on Mercer and 22 minutes on Denny, according to the study. Postgame traffic heading toward I-5 would not be as impacted because rush hour would be done and the freeway not as clogged, the study said. But the draft EIS said the immediate KeyArena vicinity would still be congested for up to an hour postgame and offered mitigation tools to alleviate delays: among them traffic-control officers, signal timing, lane closures, ride-hailing zones, more use of public transit and improved Seattle Center Monorail efficiency. Transportation and parking are two of the most controversial issues surrounding the proposed $600 million renovation by the Los Angeles-based Oak View Group (OVG). The company, headed by Tim Leiweke and Irving Azoff and partnered with the city, has proposed a 24-month renovation starting in October that would be completed in time for an NHL franchise to begin the 2020-21 season there. The draft EIS is the first step in clearing state-law hurdles before any construction can begin. A 45-day comment period on the draft EIS now begins, during which submissions to the city must be postmarked no later than June 7. A final EIS is expected by August, followed by an appeals period and the issuance of a Master User Permit. OVG hopes to have that done so it can begin the demolition phase of construction by late October. The transportation analysis concluded that traffic delays throughout the KeyArena area are already expected to increase by 2020 because of additional population growth regardless of whether a renovation occurs. It says 63 percent of fans attending weeknight games at a remodeled arena are expected to arrive in private vehicles; another 15 percent by taxi, Uber or Lyft; 10 percent on foot; 8 percent by bus; 3 percent by Monorail; and another 1 percent by bicycle. It states there are 8,229 parking spaces on streets, in garages and lots that can be used within walking distance of the venue. The study estimates they’d be at 56 percent capacity on weeknights and 64 percent on weekends during games. The study also says the re-opening of streets along major corridors and the completion of the SR-99 tunnel could alleviate congestion. It also concludes the existing monorail service could handle the expected game-night user crowd, though users might have to wait up to 20 minutes because of car capacity limits. The draft EIS, as required by law, studied the positive and negative impacts of carrying out one of three scenarios. The first scenario would see the OVG plan fully adapted, and a second would eliminate any night-time construction. A third looked at the impacts of not carrying out a renovation. The modified proposal for only day-time construction would increase the construction period to 30 months. That would cause OVG to miss the deadline for the venue to be remodeled for the 2020-21 NHL season.